I had a plan, but nothing went as planned. On December 1, I was going to help Mark with his letter to Santa—or rather, to a random volunteer from the Canada Post Santa Letter-writing Program—like we did the past three years. Then, I was going to give him the Kinder Advent Calendar—luckily, he hadn’t found it yet searching through my drawers. Then, throughout the first week of December, I was going to do my Christmas shopping downtown Ottawa, promptly wrap the gifts and store them out of sight until D-Day. You’d think so. On December 1, Feng and I had a combined fever of 80ºC, and suddenly, writing to Santa was no longer a priority unless I was promised he would personally deliver sweet drugs to make our bodies stop aching. On December 4, Mark was coughing so much his first draft letter was all wet. On December 5, the letter was written but I also knew it was probably too late to mail it and get a reply. The official deadline is December 11, yet I didn’t want to chance it because Canada Post is already swamped at this time of the year and it would be frustrating to receive a reply after Christmas. I rushed downstairs, stepped outside, rang the doorbell, place the Kinder Calendar on his shoes by the door, then ran back upstairs. Feng looked at me as if I was part of a weird dream he was having because of the fever. He swallowed a Tylenol Extra Strengh and went back to bed. Ladies and gentlemen, this is how you troll your kid. Still sick the following day, I totally forgot about the letter, which was still on Mark’s desk. “Santa didn’t get my letter,” Mark complained. The thing is, when you start something, you have to finish it. And these extra twenty-four hours bought me enough time to write a note signed “Santa” and replace Mark’s letter with my message. “No, it says ‘HO, HO, HO’”. Honestly, I didn’t think Mark actually cared much about the Santa Letter much—the last couple of years, he failed to see why Santa would write back instead of just bringing gifts—but he has been reading the message over and over again for the past few days. Note to self—next year, write something more inspirational. “I KNOW!” Feng replied, peeling a mandarin orange. How do you see Christmas as a Muslim? This is interesting to me! Here there are two trends: some Muslims consider it’s just a holiday and they celebrate it for the kids without any religious component and some tie it to Christianity and don’t celebrate. in some (muslim Indonesian) community, it is forbidden to celebrate X-mas. saying/celebrating Merry Christmas is considered a sin in some extent (and also valentine). it has been an issue every now and then. sometimes I wonder, why don’t they relax a little bit…:)) we are enjoying the holiday, anyway! I like your attitude! I think nothing should be banned, and it shouldn’t be a sin to enjoy other cultural celebrations. And I do wish more non-Muslims would be curious about Muslims celebrations too, that’s only fair! Just adorable, all around :). Hope you have a happy holiday! What about plan C, then? Plan B was enough, which is just well cause I didn’t go further in the alphabet. You’re right, a bit of Christmas magic is fine I think. I never understood believers who feel the need to convert non-believers. Like… why? Because they are RIGHT and you are WRONG. More seriously, it is an important part in some versions of christianity (mormonism, Jéhovah witnessism, evangelicalism), it is even a duty for them for “witness” to heathens. I’ve heard of this “duty”. Hell (pun intended), I know about missionaries, etc. Yet I can’t comprehend why it’s so important to convince people you’re right and that your path must be followed. I just… don’t get it. Religion would be better without proselytism. Tell me if you got a cool story with your Santa letter 😉 I think it’s almost more fun to reply to it actually! 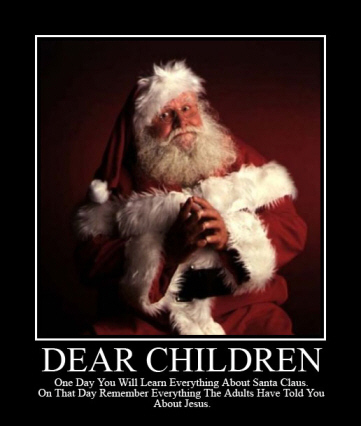 I can’t remember believing in Santa so I was never truly disappointed. But I liked the fact my parents played the script and created some magic for us, kids. I think that’s what I’m trying to do with Mark.